KEY TO A SUCCESSFUL REAL ESTATE TRANSACTIONPaula Ziegler joined the Sims & Guess team in 2003. 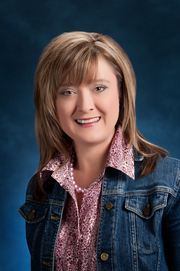 She captivates her clients in both Odessa and Midland with her attention to detail and her energizing personality. She has a passion for working with people and receives personal satisfaction from helping her clients through both the buying and selling process. Paula's outstanding ability to communicate with her clients as well as her knowledge of the area market assures her clients that they are well represented. She strives to meet the needs of her clients communicating face-to-face as well as via phone, fax, email, etc. She is happily married and has four children spanding elementary, jr. high & high school. Therefore, she is well acquainted to the needs of young families as well as those who are seniors in our community. She is a native Texan, born and raised in Odessa, and is actively involved in Mid-Cities Community Church. Paula strives for integrity and honesty in all Real Estate transactions while providing fantastic customer service to her clients. Paula's focus as a real estate agent is on making every transaction an investment in her clients future. Investing in West Texas Real Estate takes time, patience and a good sense of how the numbers work. She is a seasoned Real Estate investor herself and has worked with many investors to build a successful real estate portfolio. Whether you're a first time buyer or a seasoned investor let her walk you through to a successful transaction.